My little helper...likes warm towels!! I am going about this all wrong, and backwards...but tomorrow there is going to be a big bunch of button blog photos going on in blog land. so here is my photo. I'll add the link in the morning...all the photos will be on Analises blog...Sugar*Sugar. Isnt this the cutest little box, I'll tell you..It was UGLY when I got it..It was just a hand made box, but these drawers OH MY, they grabbed me!! The color is just what you see in the photo, with a little gold. So it took a bit of work and layers to get the box to match..I was going to sell it, but you know how it goes...I'm going to have to wait until something else comes along to take its place.lol My little birdie on the left is a work in progress. The one on top is one I sent to Somerset Mag. I'll be putting it out for sell real soon. The one on the right just sold. I'm going to try to get my cupcake charms put on etsy tomorrow...wish me luck.lol. 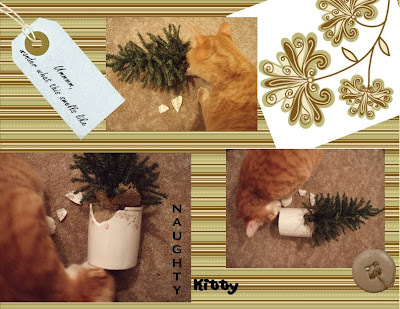 Oh my sweet little helpers. Can you just hear them..hey bro...what do you think is in here!! I was going through a little box of mish mash of jewelry, someone wanted to help! I had some "play" time..I cast these little vintage looking treasures. I used fimo clay and then poured in plaster of paris...it worked a bit better then my cupcakes!! One piece is MIA..where do you think the kittys sent it flying off too? Do you SEE the tip of this can of air...little hard to blow off the computer now!! Have a great weekend...No more Snow!! My high speed internet decided to take a break! So the tech is to come this morning...guess what! Its working...isnt that the way it is. 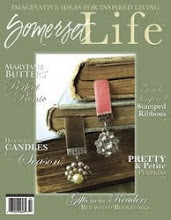 I thought I would show you the photos of the Somerset Life Mag. They sent me an early copy. My birdies in print...I'm thrilled! Oh the morning sun was shining through my window! Here is another sweet baby shoe...it doesnt really show, but I spritzed it with gilmmer mist, there is the softest hint of antique pink glimmer. I decided it was time...I gathered all my tools and gadgets. Went and bought a tile to put it all on and now I have a soldering station. I found this clip in the paint department at Home Depot it is perfect for holding up the glass for soldering. My soldering iron is about 20 years old. A bit of crud on the tip. I got it cleaned up, still isnt staying hot on the tip, so I plan to get another, anybody have any idea what kind I should get? I would love to hear what is being used out there. No one mentioned my ooops...got my banner just a bit big, dont you think. LOL!! I'm going to take you on a little tour of Staceys apt. It is so darn cute!! Look at her printer...nope, you cant buy them like that! Didnt she do a great job painting it! We have found quite a few pears at thrift shops, she has repainted them. The black and white candle on the right is a handcarved candle, so beautiful when lit. Here are two handcrafted vase holders, we have the most wonderful art fair every summer. An Ikea curtain, it puts such a pretty color in the room with the sun shining through it. Ok! Who says you cant paint your toaster if it isnt the right color! LOl. Yep, she painted it! Heres another one of these wire shelfs...she LOVES them!! This isnt the best picture, but I had to show you this HUGE pear, it is brass and she painted it, Look at the great fork! She painted that too. The phone jack is on the wall, so she has to put her phone somewhere. Look at this great collection of LeCreusets!! I love how these older apt.s have such character..We did find out this use to be an old motel! All the things you see here...bought at different thrift stores! See those bottles on the right and that frame. Stacey sent in photos to Jones Soda and they put them on their bottles...you should have heard me whoop it up in the store when I found them.LOl They have her name on them and where shes from...pretty cool!! on the bottom shelf...little tiny pear salt and pepper, glass and metal, she bought those off of ebay. One last shot...a few more of the unique salt and pepper grinders that she has found and painted! Hope you enjoyed seeing what a 26 year old likes.. I'll pick a winner tomorrow!! I'll be picking a winner tomorrow, so be sure and comment if you are interested!! Let me explain this picture!! While my husband was getting in the closet...his jacket fell off the hanger. This little one crawled inside the sleeve and was wiggling around. Dean got to laughing and called me in, I of course...ran and got my camera, then he poked his head out.Soooo darn cute! This is my latest...cute shabby chic teapot. I dyed the lace with glimmer mist. Its listed on my ebay. 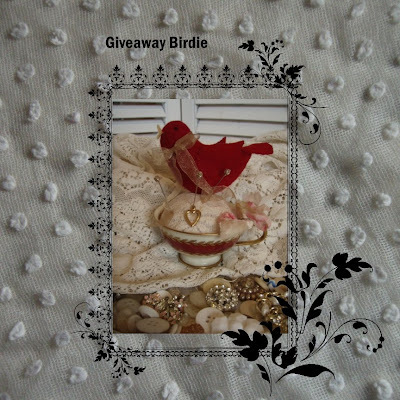 Dont for get to sign up for my free blog giveaway, It's the little red birdie in the cup! Just leave a comment on THAT post. HAPPY BIRTHDAY TO MY FAVORITE DAUGHTER, STACEY!!! WoW 200 posts!! I cant believe it! REALLY!! I have Never had such fun and ALL the wonderful gals that I have met!! I LOVE YOU ALL! 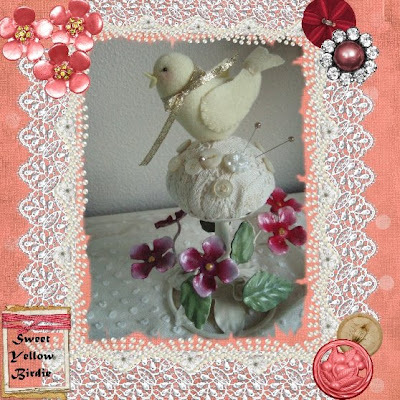 SO....see this little red birdie...well, I am giving it to one of my wonderful blog readers!! I will pick a winner in a few days...do I need to pick a date right now?? Ok, how about Fri eve. Just leave me a message on this post and a name will be picked!! Now on to a BIT more red...Stacey and I went to a great antique sale and she found this...anybody know what it was used for?? ?...other then a kitty holder!! Looking closer it use to be black...we sprayed it, it is now black again. Nothing is safe from these two!! 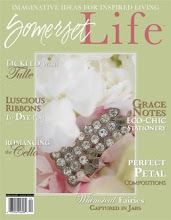 One more thing...I got an early copy of Somerset Life with my birdies in it...4 PAGES!! wooohooo! Who would have thought!!! 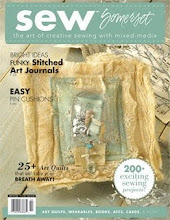 It is SUCH a lovely magazine!!! This first photo is a little blah... But, look at that handle...its a beauty. Here is my latest creation that I just put on ebay...photo is just a bit busy. How many photos do you guys take before you get one you like?? It was sooooo yummy, he asked his brother to join him. Do you like that classy vase. LOL, my hubby loves starbucks ice tea...I'm glad he finished it!! Another subject...I was checking out Dawns site The Feathered Nest, and she showed this book. I googled the author and she is having a class up in Portland...The one class I would like to take is full, she said she would open up another class on fri if there is enough interest...anybody in the area interested?? This is neat, but not where I want it! Tarnished Silver and Baby Shoes OH MY! !